Not all Then & Now articles relate to dramatic changes or destruction and reconstruction. 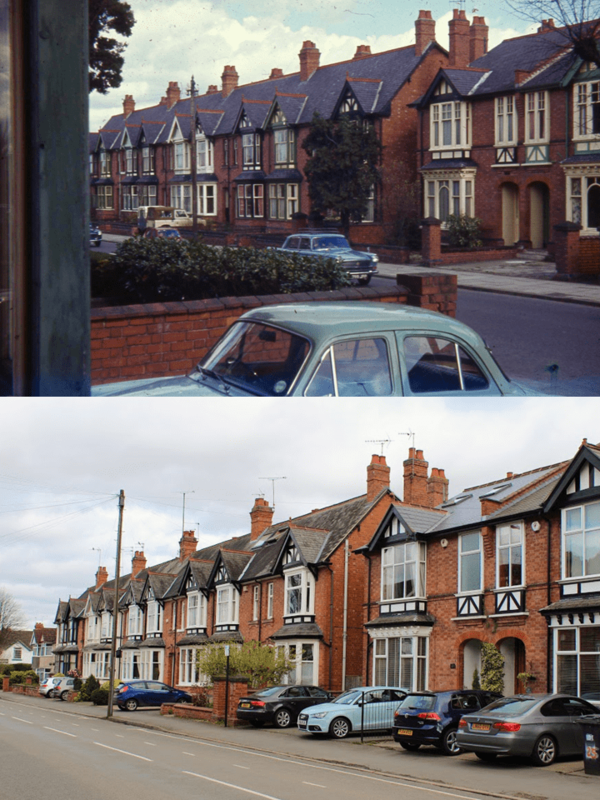 This Then & Now comparison shows a Waverley Road of the 1960s that is immediately familiar to modern eyes. In fact, only the differences that really stand out are the models of the cars on display. A few more front gardens have since been sacrificed for off-street parking too. According to A Portrait of Kenilworth in Street Names (Rookfield Publications, 2015) by Robin D Leach and Geoff Hilton, Waverley Road was built as Oakley Road in 1885, before being changed to Waverley by the local board in 1889. The name Waverley relates to the first of Sir Walter Scott’s series of novels, of which his novel Kenilworth was a part, by which the whole series came to be known. The nearby Waverley Day Centre also takes its name from this. The use of the name Talisman around the town is also taken from a novel in the series. Both photos are taken from the west side of the road looking north-east towards Station Road. The ‘then’ photo was taken from somebody’s front garden with the property’s bay window intruding into shot. The ‘now’ equivalent was taken from the pavement to avoid unduly trespassing on somebody’s property for the sake of accuracy!